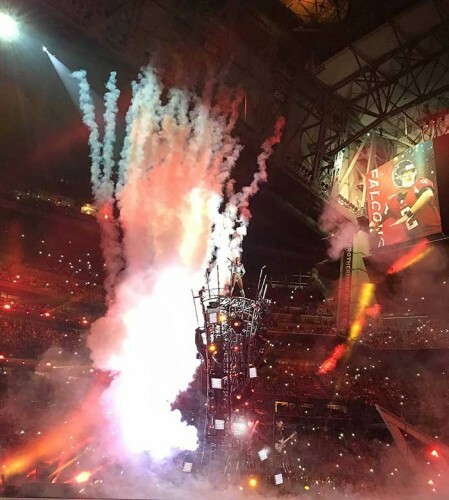 USA – On 5th February Houston, Texas played host to the NFL’s Super Bowl LI, fought out between the New England Patriots and the Atlanta Falcons at NRG Stadium. Entertaining the crowds in the hotly anticipated Pepsi Zero Sugar Halftime Show was Lady Gaga, whose high-octane performance earned the respect of millions in an intense 13-minute spectacular that was viewed by over 115 million people worldwide. The show was another world-class collaboration from co-production designers, Bruce Rodgers of Tribe Inc. and LeRoy Bennett of Seven Design Works, and lighting designer, Bob Barnhart of 22 Degrees. Ayrton was, once again, proud to be part of this show with 81 new MagicDot-XT fixtures, 40 new MagicPanel-FX fixtures and a solitary CosmoPix-R chosen to adorn the major scenic elements of Barnhart’s lighting design. Bennett chose not to use video in the show in favour of something different that would focus the attention on Gaga’s performance. “I wanted something more raw, to say something about Gaga. So Bruce and I came up with the same inspirational tear-sheet – a chequerboard stage with its grid work illuminated from beneath and emanating smoke to add another dimension to what would be traditionally a flat surface.” Flanked by the fallen stars, the stage was backed by two tall towers which provided scenic lighting as well as being a statement in themselves appearing, at one point, to be on fire. Each tower was rigged with 20 of Ayrton’s new MagicPanel-FX, and additional spot fixtures, placed on the façade in a random layout to help with the look of the over all production design. MagicPanel-FX units were also located in the base of the towers and used to up-light the towers themselves. Aside from the beam capabilities and movement, Barnhart made use of the MagicPanel-FX’s internal macros to create graphics that played across the face of the fixture, offering great time-saving during programming in the short production time available. Barnhart chose another new Ayrton product, MagicDot-XT, to create a second scenic piece, an outlandish piano feature – one of Lady Gaga’s signatures – which in this case took the shape of a globe. 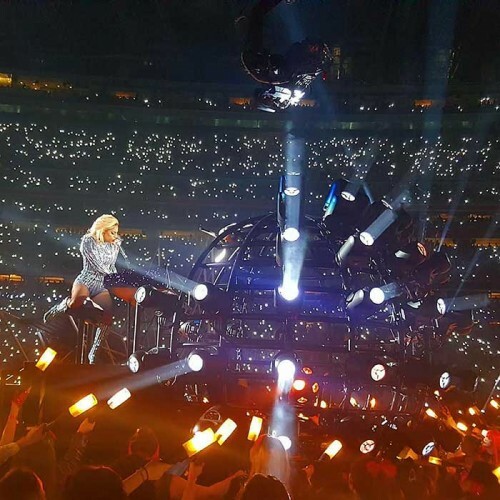 “The idea came from Gaga herself who wanted a sphere that represented the planet, with a multitude of light beams emitting outward from it,” explains Rodgers. “We designed the shape as a series of custom-bent latitudinal and longitudinal pipes clustered with an array of MagicDot-XT fixtures specified by Bob. 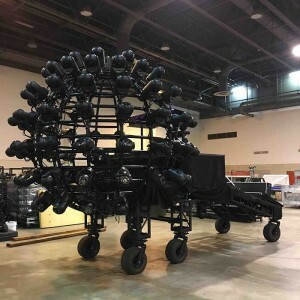 This shape melds into a grand staircase and the entire combination was mounted on a wheeled cart frame to roll it onto the field.” The globe, like the towers, was fabricated by All Access Staging & Production.